A messy room is not the softest landing out there, but Archer will make due with it. Archer only has a vague recollection of who he is, which is not the best state to be in when about to take part in a war. However, he understands his purpose well enough, and has no qualms about carrying it out. The mage who summoned him might have a sharp tongue and a short temper, but at least she is more than capable in her craft, which is just what Archer wanted. 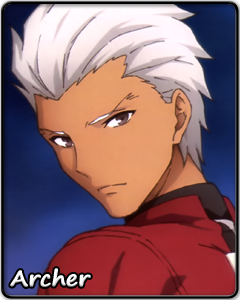 Archer is a man of conflicting characteristics. He would refuse to help someone who does not meet his standards, yet he will move to save the same person, even against his better judgment. Archer prefers ending things as quickly as possible, but knows when it is necessary to retreat and rethink one's strategy. Archer would rather work with people useful to him, but is often seen going off alone doing his own business. What could it be that occupies the mind of the man who cannot recall his true name? Atop a hill of blades, he continues to pray.